It has been a delight to follow the refurbishment of the splendid Vanguard catalog. The span of repertoire – from Bartók to Berlioz, Chopin to Shostakovich – performed by first rank artists in excellent sound, provides an intriguing window on the past, as well as lending perspective to recent performances. I don't put much stock in the alleged hegemony of our artistic forebears – familiarity has always bred notions of superiority, particularly among conductor cultists – but in Vanguard's trove I have found moments that will endure. 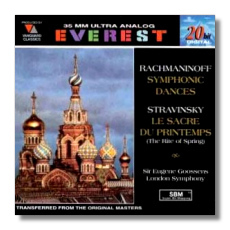 One of Vanguard Classics projects has been to restore Everest Records' vintage 35mm film and ½-inch master tapes from the years 1958-1961. Vanguard president Seymour Solomon likened their discovery (in a West Coast warehouse) to "breaking into King Tut's tomb." Despite their neglect, most of the masters emerged from their entombment quite pristine. Upon their transfer to a 20-bit masterdisc, the master tapes, under the supervision of a Sony engineer, were converted to the standard 16 bit format using the Super Bit MappingTM, a process that aims to capture the sonic detail of the original. The result is a recording quality to rival the best of the day. The London Symphony under Sir Eugene Goossens make a splash in Rachmaninoff's "Symphonic Dances and Stravinsky's "Rite of Spring" (EVC 9002). Goossens played the English debut of "Rite" in 1921; in his 38th year with the piece, he opts for broad tempi that emphasize textural clarity and good dynamic contrast. The "Dance of the Earth" comes to a thunderous conclusion, surpassing in sheer volume my modern recording and demonstrating the potency of the original 35mm film. 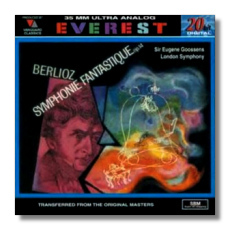 Goossens and the London Symphony are paired again for the "Symphonie Fantastique" (EVC 9017) where they achieve a suave string tone. 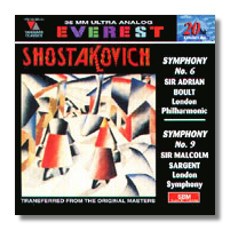 Shostakovich Symphonies 6 and 9 receive committed readings from Sir Adrian Boult (London Philharmonic) and Sir Malcolm Sargent (LSO) respectively (EVC 9005). The largo of the Sixth creeps like mist over a miasmic bog, such is the chilling effect of Shostakovich's stark orchestration. Sargent leads a puckish 9th, an unusually fine-boned piece from 1945 that surprised audiences with its lack of war gestalt. 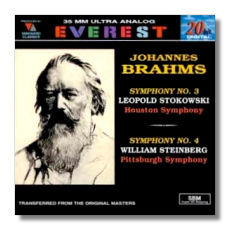 Moving from Walthamstow Hall to Houston and Pittsburgh, Everest captured Stokowski and Steinberg leading their American orchestras in Brahms symphonies (EVC 9016). Stokowski's Third blazes: in jabbing attacks set off by pulchritudinous swells, we get a Brahms as seen through Stoki's kaleidoscope eyes. Steinberg's Fourth sounds rather four-square by comparison, but he seems more convinced of the score's intrinsic value. Vive la difference! Vanguard's house label has a bevy of its own past masters, and their partnership with Maurice Abravanel and the Utah Symphony is the centerpiece of that legacy. 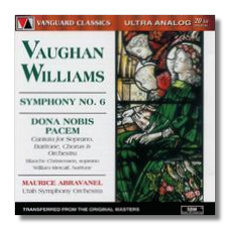 Among the recordings: Vaughan Williams Symphony #6, a grim remembrance of the war, and the Dona Nobis Pacem, a cantata for soprano, baritone, chorus and orchestra (SVC-7). Both recordings venues – the University of Utah (now Abravanel Hall) and the Mormon Tabernacle – yield excellent acoustics. 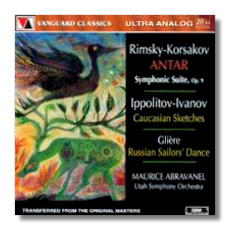 My favorite Abravanel disc thus far is a tangy compote of old Russia: Rimsky-Korsakov's "Antar" Symphonic Suite, the "Caucasian Sketches" of Ippolitov-Ivanov, and a roof-raising "Sailors' Dance" from Glière's The Red Poppy (SVC-8). The verve of these 1967 recordings is recreated in the startling 20-bit SBM remastering. 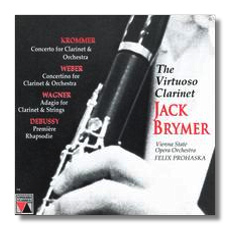 Two instrumental CDs worth noting are "The Virtuoso Clarinet," featuring British clarinetist Jack Brymer in the Krommer concerto and concert pieces by Weber, Wagner and Debussy (OVC 8090) and a Chopin recital by pianist Jeanne-Marie Darré (OVC 8092). The Darré is a real find – her chiseled tone and direct approach in the Préludes strip are refreshing. Some may find her style too sunlit, as opposed to Ivan Moravec, who can write a book with a single phrase (and may take the time as well). 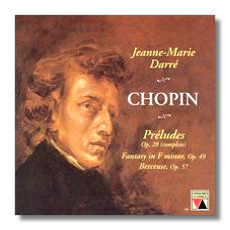 Excellent renditions of the Fantasy and the Berceuse round out this valuable release.